We are able to put forth a quality compliant range of Pigmented PTFE Bush. It is widely appreciated for its optimum quality, superb finish and dimensional accuracy. This range is offered in different colors such as yellow, black, blue, red and green. We manufacture this range as per the demands of our clients. We offer this range at industry leading prices. 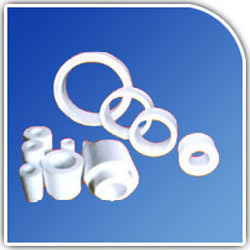 We are able to design a highly qualitative range of PTFE Bush. It is available in different diameters ranging from OD 12.5 x ID 6 mm To OD 300 x ID 275 mm (Standard) as well as in standard length of 100 mm. In addition, we also offer it in up to 1500 mm diameter and length up to 600 mm. Offered at industry leading rates, this range is duly tested for flawlessness and exceptional performance. 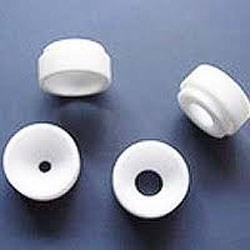 We are engaged in manufacturing and supplying an extensive range of Reinforce PTFE Bush. These products are durable in design and dimensionally accurate. All the products are manufactured with precision by our trained team of engineers using high grade raw material. Numerous industries across the nation avail our products for their optimum quality. These products are offered in multiple sizes, designs and finishes in order to meet the specific demand of our clients.